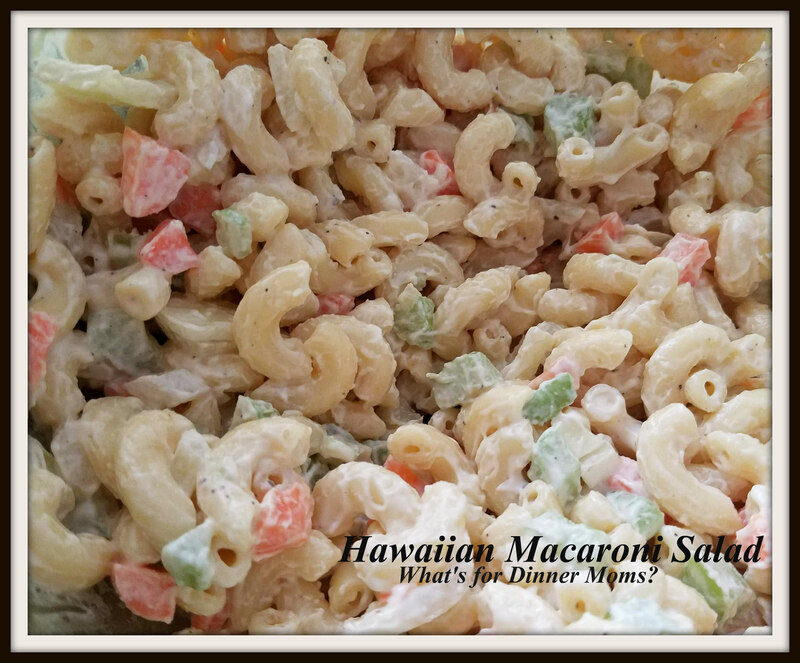 Hawaiian Macaroni Salad – What's for Dinner Moms? We are pretending it is almost Spring. We had grilled hot dogs with macaroni salad and brown beans. We almost never have hot dogs so the kids thought this was a real treat. Sitting on the floor in the living room pretending that it is Spring may be the way I survive the next month or two of Winter. This is our favorite macaroni salad. We love vinegar and this macaroni salad has a delicious sweet/tart tang to it. I think it tastes the closest to some of our grocery store macaroni salads. I stumbled upon this recipe several years ago Hawaiian Macaroni Salad (click for original posting from May 17, 2013) and since that time have made a bit of a change to how we make it. I encourage you to play with the recipes a bit and make them your own. We have done this with this salad. We love vinegar so we added a splash of vinegar after the macaroni has cooled along with a bit more mayonnaise, milk and sugar. This is delicious. Why is it called Hawaiian Macaroni Salad? I guess in Hawaii there is something called an Hawaiian Plate Lunch that people make and this macaroni salad is part of the meal. It is creamier and has a bit of tartness to it. Someone once told me there was nothing Hawaiian about this because it didn’t have ham and pineapple in it. That made me laugh. Just because something is said to come from Hawaii does not mean it has to have ham and pineapple in the dish. A creamy macaroni salad with a sweet/tart flavor. Boil pasta according to directions on package. When pasta is cooked remove from heat and drain pasta. Return pasta to pan and immediately mix in the apple cider vinegar. Let sit for about 10 minutes while the pasta cools a bit. Mix together the 1 tablespoon brown sugar, 1/2 cup milk, 1 cup mayonnaise, salt and pepper in a bowl. Place pasta in a large dish and mix the milk and mayo mixture into the warm pasta. Once it is thoroughly mixed place the pasta dish in the refrigerator to cool completely. Mix carrot, onion, celery, 1/2 cup milk, 1/2 tablespoon brown sugar and 1 cup mayonnaise in a dish. Once pasta has cooled mix this into the pasta with an extra splash of vinegar, as desired, then refrigerate for at least an hour. The longer it sits the better the flavors blend. Taste and add salt and pepper as needed.